The antibody can recognize all isoforms of Bim. The antibody does not cross-react with other Bcl-2 family members. Synthetic peptide within Human Bim aa 1-100. The exact sequence is proprietary. WB : Raji, Jurkat, A431, Molt-4, A20, MEF, Raw264.7 and PC-12 cell lysate; Human and mouse thymus, mouse and rat spleen tissue lysate. IHC : breast carcinoma tissue. ICC/IF : A20 and Raji cells. FC : A431 and Raji whole cell lysate. HAP1-WT cells. IP : Raji whole cell lysate. Mouse and Rat species are recommended based on WB results, we do not guarantee IHC-P for Mouse and Rat. Our Abpromise guarantee covers the use of ab32158 in the following tested applications. WB 1/500 - 1/2000. Detects a band of approximately 22 kDa (predicted molecular weight: 22 kDa).Can be blocked with Bim peptide (ab179844). Induces apoptosis. Isoform BimL is more potent than isoform BimEL. Isoform Bim-alpha1, isoform Bim-alpha2 and isoform Bim-alpha3 induce apoptosis, although less potent than the isoforms BimEL, BimL and BimS. Isoform Bim-gamma induces apoptosis. Isoform BimEL, isoform BimL and isoform BimS are the predominant isoforms and are ubiquitously expressed with a tissue-specific variation. Isoform Bim-gamma is most abundantly expressed in small intestine and colon, and in lower levels in spleen, prostate, testis, heart, liver and kidney. The BH3 motif is required for Bcl-2 binding and cytotoxicity. Mitochondrion and Endomembrane system. Associated with intracytoplasmic membranes. Lanes 1 - 4: Merged signal (red and green). Green - ab32158 observed at 25 kDa. Red - loading control, ab9484, observed at 37 kDa. ab32158 was shown to specifically react with Bim when Bim knockout samples were used. Wild-type and Bim knockout samples were subjected to SDS-PAGE. ab32158 and ab9484 (Mouse anti-GAPDH loading control) were incubated overnight at 4°C at 1/500 dilution and 1/10000 dilution respectively. Blots were developed with Goat anti-Rabbit IgG H&L (IRDye® 800CW) preabsorbed ab216773 and Goat anti-Mouse IgG H&L (IRDye® 680RD) preabsorbed ab216776 secondary antibodies at 1/10000 dilution for 1 hour at room temperature before imaging. Overlay histogram showing HAP1 wildtype (green line) and HAP1-BCL2L11 knockout cells (red line) stained with ab32158. The cells were fixed 80% methanol (5 min), and then permeabilized with 0.1% PBS-Triton X-100 for 15 min. The cells were then incubated in 1x PBS / 10% normal goat serum to block non-specific protein-protein interactions followed by the antibody (ab32158, 1µg/ml) for 30 min at 22°C. The secondary antibody used was Alexa Fluor® 488 goat anti-rabbit IgG (H&L) presorbed (ab150081) at 1/2000 dilution for 30 min at 22°C. 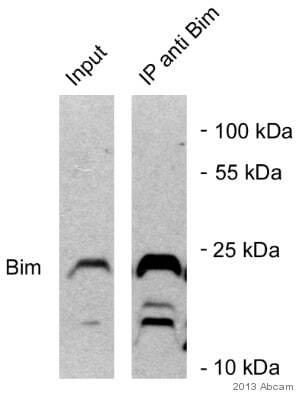 A rabbit IgG1 isotype control antibody (ab172730) was used at the same concentration and conditions as the primary antibody (HAP1 wildtype - black line, HAP1-BCL2L11 knockout - grey line). Unlabelled sample was also used as a control (this line is not shown for the purpose of simplicity). Immunocytochemistry/Immunofluorescence analysis of Raji (Human Burkitt's lymphoma cell line) labeling Bim with ab32158 at a dilution of 1/250. Cells were fixed with 100% methanol. Ab150077 (1/1000) was used as the secondary antibody. Cells were co-stained with ab7291, a mouse anti-tubulin antibody (1/200) using ab150120 as the secondary. Nuclei were counterstained with DAPI (blue). Secondary antibody only control, cells without incubation with the primary antibody was used as negative control. ab32158 staining Bim in human breast cancer tissue sections by Immunohistochemistry (IHC-P - paraformaldehyde-fixed, paraffin-embedded sections). Antigen retrieval was by heat mediated antigen retrieval using Tris/EDTA Buffer, PH9 (ab93684). Samples were incubated with primary antibody (1/100 in blocking buffer) and a Biotin-conjugated Donkey anti-rabbit IgG polyclonal (1/500) was used as the secondary antibody. Cytoplasmic staining can be seen in the human breast cancer cells. Hematoxylin was used as a counter stain. Flow Cytometry analysis of Raji (human Burkitt's lymphoma) whole cell lysate labeling Bim with ab32158 at 1/100 (red). Cells were fixed with 4% paraformaldehyde. An Alexa Fluor® 488)-conjugated goat anti-rabbit IgG (1/2000) was used as the secondary antibody. Black - Isotype control, rabbit monoclonal IgG (ab172730). Blue - Unlabelled control, cells without incubation with primary and secondary antibodies. Ab32158 at 1/50 immunoprecipitating Bim in Raji (human Burkitt's lymphoma) whole cell lysate. Lane 2 (+): ab32158 + Raji whole cell lysate. 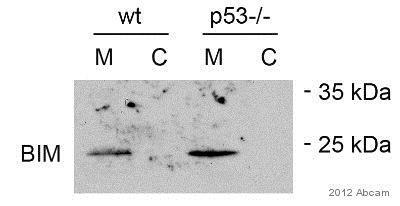 Lane 3 (-): Rabbit monoclonal IgG (ab172730) instead of ab32158 in Raji whole cell lysate. For western blotting, ab32158 (1/1000) was used as the primary antibody and ab131366 VeriBlot for IP Detection Reagent (HRP) was used for detection (1/10 000). Immunocytochemistry/Immunofluorescence analysis of A20 (Mouse reticulum sarcoma cell line) labeling Bim with ab32158 at a dilution of 1/250. Cells were fixed with 100% methanol. Ab150077 (1/1000) was used as the secondary antibody. Cells were co-stained with ab7291, a mouse anti-tubulin antibody (1/200) using ab150120 as the secondary. Nuclei were counterstained with DAPI (blue). Flow Cytometry analysis of A431 (human epidermoid carcinoma) cells labelling Bim with ab32158 at 1/50 (red). Cells were fixed with 4% paraformaldehyde and permeabilised with 90% methanol. An Alexa Fluor® 488-conjugated goat anti-rabbit IgG (1/2000) was used as the secondary antibody. Black - Isotype control, rabbit monoclonal IgG. Blue - Unlabelled control, cells without incubation with primary and secondary antibodies. 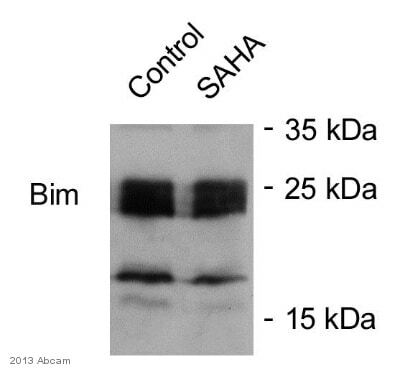 Western blot - Anti-Bim antibody [Y36] (ab32158)This image is courtesy of an anonymous abreview. Primary diluted in PBS (5% BSA + 0.1% tween20) and incubated with sample for 1 hour and 30 minutes at 20°C. Publishing research using ab32158? Please let us know so that we can cite the reference in this datasheet.